Spartan DX Personal DNA Analyzer For Playing C.S.I. At Home | OhGizmo! Forget about randomly accusing your roommates of drinking all the milk. Now you can be a C.S.I. and process your own DNA evidence to find who the freeloader really is. The Spartan DX takes the giant mainframe computers typically used for DNA processing and shrinks them down into a considerably smaller device. What you get is a PCR or polymerase chain reaction DNA analyzer that can provide results in less than 30 minutes for up to 4 unique samples. Of course at $14,995 you might just be better off to buy a new carton of milk but if you’re working in a lab that deals with small batches of DNA samples every day the Spartan DX is probably the type of device you’ve been waiting for. It only takes about 10 minutes to learn how to use it and it doesn’t require any other external hardware except for maybe a flash memory card for transferring the results. 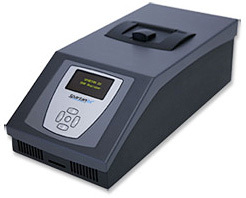 The Spartan DX is a real-time PCR instrument. This means that you get the results right away on the LCD display and there is no need to run a gel.